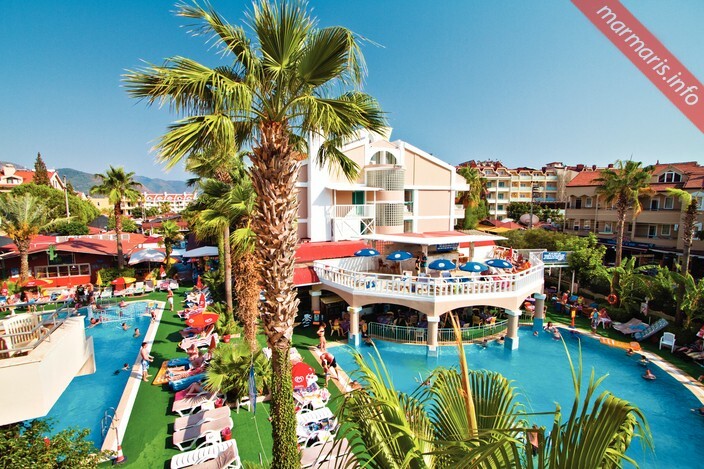 Club Atrium and Hotel is located in Marmaris, and features two large swimming pools along with two separate kids’ pool among the lovely palm trees. The hotel has a spa center with Turkish bath and well-maintained air conditioned rooms. Earlier known as Melay Hotel, the hotel was renamed as Club Atrium and Hotel in 2004 after it was acquired by the adjacent Club Atrium Apartments. The rooms decorated with wooden furniture and long curtains offer the environment a comfortable setting. The rooms are well-equipped with interesting amenities like a furnished balcony and satellite TV. The Havana Restaurant within the hotel has mouthwatering Turkish, British and international cuisines on offer. The guests can savor their meals indoor or outdoor in the hotel garden along with a Cuban beer. If you are looking for more food varieties, you can choose to have Indian or Chinese food at the Tai Pan Chinese Restaurant. 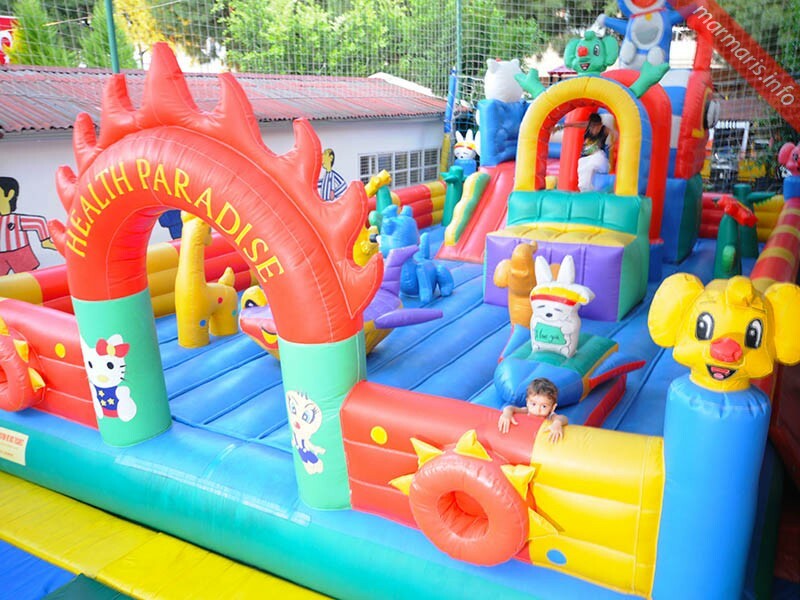 Children accompanying you have a separate playground with trampoline, and bouncy castle as well. They can enjoy the games consoles, cots, mini-discos and highchairs. 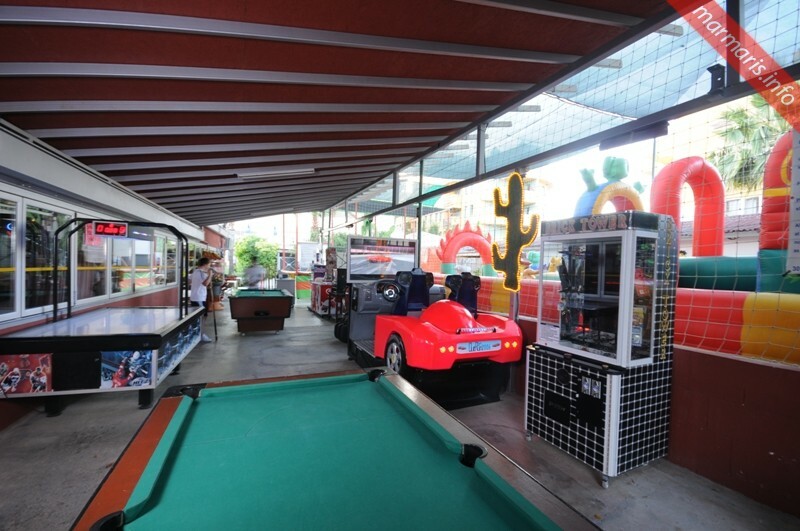 The hotel’s entertainment team arranges night shows, bingo, karaoke, live music and competitions to keep guests engaged. You can also enjoy shopping from the market stalls nearby. The famous Marmaris Amphitheatre is just 500 meters from the hotel. There is a frequent dolmus service from near the hotel to visit interesting places like the Bar Street , the beach and the Marmaris center. Along with the two large swimming pools, the guests have some other places like the sun terrace with parasols and sun-loungers, a la carte restaurant, snack bar at the pool, the popular Bar Cuba that runs until late night, the spa with steam room, massage center and Turkish bath, studios, beauty salon, facilities for billiards and table tennis will certainly keep you engaged throughout your stay here. The property has both, the hotel rooms and apartments. The kitchenettes in the Club Atrium Hotel Marmaris are provided with a fridge, kettle and such other features to aid guests who prefer to cook on their own. The bathrooms have showers and separate hairdryers as well. The front desk offers you a warm welcome and staff elsewhere is friendly and attends you with a smiling face. 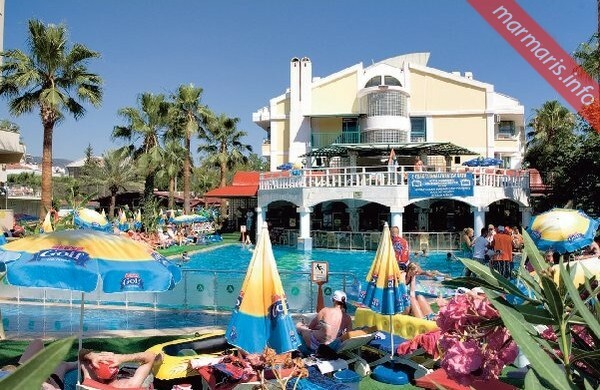 Club Atrium in Marmaris is a family centered complex with a friendly and lively atmosphere. The clean, comfortable rooms along with a large variety of on-site facilities, pleasing services and special care for children have made this place more popular with the families.